According to MetService meteorologist Georgina Griffiths, "winter came early" - but only briefly - to the southern South Island. But why? It appears slow-moving weather systems east of New Zealand and a weaker than normal jetstream to the south conspired to keep the bitterest winds at bay. Niwa meteorologist Ben Noll said a major factor was a blocking ridge of high pressure to the east of the country, with lower pressures than normal towards Tasmania. "That isn't a good combination for colder than average temperatures." Overall there were plenty of southerlies and southwesterlies throughout winter. But only two were cold enough to bring hail and noteworthy snow to low levels. The first bitter southerly was early - in the second week of April - while the coldest, snowiest outbreak was in the first week of June. After that the southerlies faded in intensity and frequency. Ms Griffiths said July was then dominated by mild northwesterly weather across southern districts and August was fairly average, with a mixture of warmer and cooler spells. "If you look at the end of last year and start of this year, there were big temperature anomalies when we had the marine heatwave. "But then as we went into April and May, there were some real short, sharp, cold spells. Your winter came early - it was quite savage but not long lived," she said. 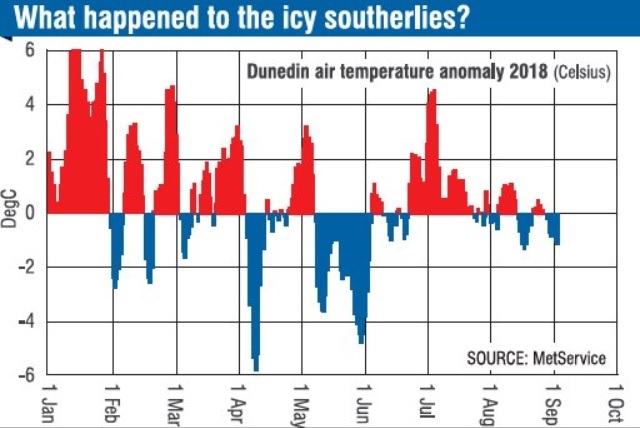 WeatherWatch managing director Philip Duncan said the lack of polar southerlies was partly due to blocking areas of high pressure south and east of New Zealand. That block effectively held up low-pressure systems and the southerlies following them which, as a result, ran out of steam as they moved across the South Island. "This year we've been seeing quite a few highs from Australia dropping south over Tasmania and then south of the South Island, effectively acting as a `shut-off valve' to the polar southerlies. "This year we've actually had more southerlies than previous years, but they have often only been `local southerlies', in which the origins of the airflow don't start near Antarctica - the air may start in central Australia and head south towards New Zealand then turn and curve up as a southerly airstream." Mr Noll said another influence on the mild winter was a weaker than normal polar jet stream - a ribbon of very strong winds in the upper atmosphere linked to temperature changes - to the south. "That meant we had fewer low-pressure systems tracking in from the southerly quarter than normal and therefore we didn't regularly draw cold air northward from the Southern Ocean, hence a lack of snowfall for some ski areas in the South Island and warmer than average temperatures overall."